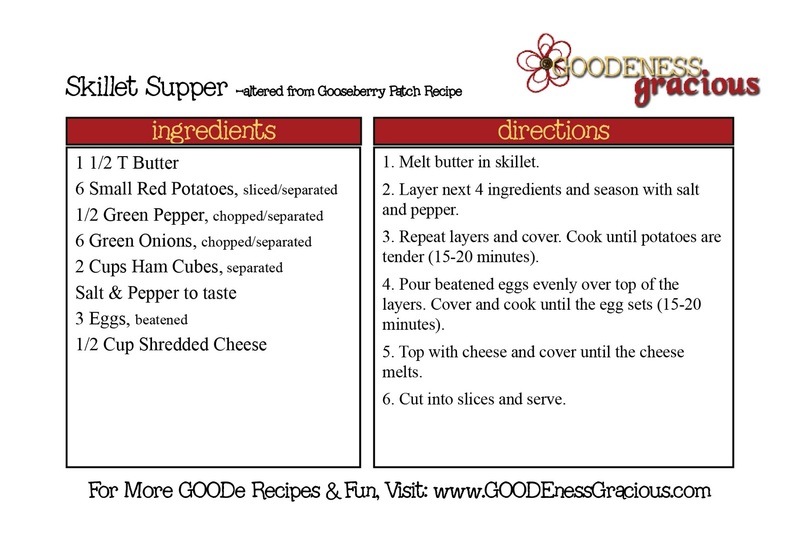 Jumping right into my Goode & Gooseberry Project, tonight’s recipe is Skillet Supper. I bet you couldn’t guess that this recipe comes from Gooseberry Patch’s Mom’s Favorite Recipes. Now, I made this puppy last week when I was out of town and my family needed a home cooked meal to balance out the happy meals and takeout we had been living on while away from home. Truth be told, cooking away from home and dealing with the cooking equipment supplied (or lack there of in this case) has its challenges. I opted to purchase a non-stick skillet as a minimum and make due with the rest 😉 Stay tuned… it gets a little comical when I can’t find a skillet lid. Anyhoo, I started by melting 1 1/2 tablespoons of butter in my skillet. I layered half of my red potatoes in the skillet. Then I moved on to chopping up green onions. And tossed half of the onions in the skillet with 1 cup of ham cubes. Now you repeat the layers. So what is a girl to do when her very first official Goode and Gooseberry Project recipe is in jeopardy? So I cooked these layers until the taters were tender. Since they were red potatoes–a softer variety– they cooked up pretty fast– around 15 minutes or so. Meanwhile I grabbed 3 eggs and popped them in a coffee cup. We’d always use coffee cups growing up to beat eggs for egg sandwiches in the morning… Just add salt and pepper and take a fork and beat away. Anyhoo, I used the same method here and then poured the beaten/seasoned eggs throughout my skillet. Get ‘er all in there and go hunt down that handy dandy lid. Put a lid on it and wait for it to set up. About 15-20 minutes later, the egg is nice and solid. And cover one more time with that stellar lid of yours–just to get the cheese all melty. And YES, melty is a word in my world. How else would you describe it? Yum! Perfect with a side of ketchup! That looks yummy! Now I'm hungry for breakfast! Looks super easy and yummy – mykind of meal! With our sudden turn to cool weather, this looks even more appealing and doable! Yum! This does look yummy! I was wondering what to make for dinner this week…I think this might have to be added to the menu! I am going to make this tonight except I am going to use smoked turkey sausage instead because that is what I have on hand. Hey Cris! I make this often after church on Sundays and use the Simple Potato hashbrowns. Then I broil it quick to get the cheese bubbly and brown. It's yummy! Love this project you are doing. Great recipes! We LOVE breakfast for dinner. Friends of ours call it brinner…to be honest, I am not a morning person, so typically it's cereal for breakfast and we eat this kind of stuff for dinner! Visiting from Kelly's Korner. This looks great and I love that you made it in the hotel! Can't wait to try and check out the rest of your blog.